Kim Babbitt (left) and Leslie Barber, who led an effort to help maximize the success of students transferring into UNH's College of Life Sciences and Agriculture from New Hampshire community colleges. The UNH College of Life Sciences and Agriculture and the Community College System of New Hampshire (CCSNH) have signed a universal articulation agreement that for the first time creates a pathway for students seeking to transfer from any of the seven community colleges in New Hampshire into any of the 10 life science programs at UNH. The new agreement addresses a longstanding dual challenge that transfer students commonly face —understanding whether the courses they take at their community college will be accepted for credit and having confidence that if they take core courses required for their major before transferring, the courses will be equivalent in scope and difficulty to those at the four-year institution. Kim Babbitt, COLSA’s associate dean of academic affairs, and Leslie Barber, professor of biology at Great Bay Community College and faculty fellow at CCSNH, spearheaded the articulation, which involved many stakeholders, including faculty, vice presidents of academic affairs, registrars, admissions, advising offices and department chairs. But the agreement is more than an outline of the specific courses and grade point averages students need in order to transfer into one of the university’s life science majors. It’s the product of a painstaking process to establish equivalency among the courses on all eight campuses. 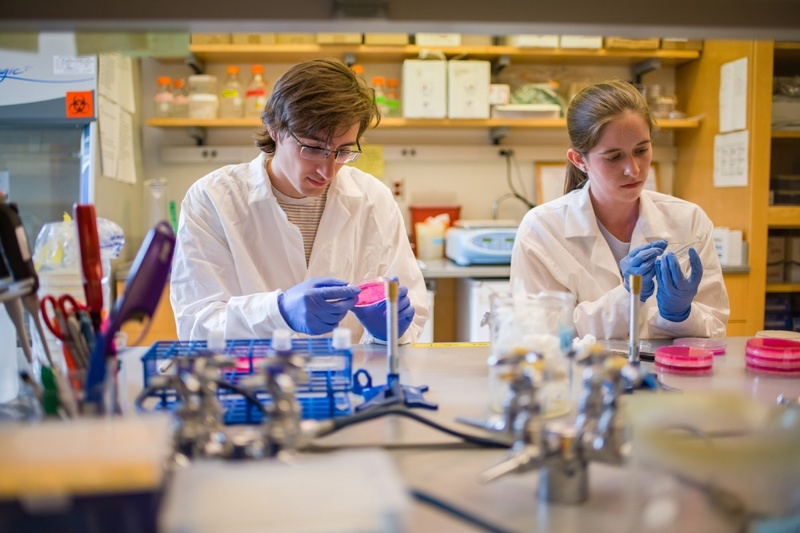 UNH College of Life Sciences and Agriculture students examining the diversity of antibiotic-producing streptomyces bacteria in earthworm mucus. Babbitt and Barber, together with colleagues from COLSA, the College of Engineering and Physical Science and CCSNH, compared syllabi, the coursework and the assessments to determine whether the courses were equivalent in breadth, depth and rigor. When they found a course that wasn’t commensurate, the two worked with faculty to make the needed adjustments. Altogether, they established equivalency for 43 biology courses, 10 chemistry courses, 15 physics courses and 19 math courses, which make up the core requirements of COLSA’s life science majors. In the past, Babbitt says, community college courses were deemed equivalent by examining a course outline without a thorough comparison of the content. Students would arrive at UNH unprepared for the work required in higher-level courses and might have to repeat these courses due to poor performance. This could lead to longer graduation times and paying twice for the same course, which undermines the cost saving achieved by starting out at a community college. What’s more, rather than simply focusing on general education classes at the community college, the clear guidance and assured equivalencies mean students can confidently enroll in core courses like biology and anatomy and physiology that count toward their majors at UNH. The alternative — saving all the intensive lab courses for UNH — is a plan that Babbitt warns against. In 2011, Babbitt and Barber collaborated on an articulation agreement that defined a pathway for Great Bay Community College students and involved the same deep-dive course equivalency approach. Encouraged by the success of this latest agreement, Barber is now using their universal articulation model to establish course equivalency between the community colleges and UNH’s College of Liberal Arts. She plans to expand the effort to include other four-year public colleges in the state. Babbitt and Barber will re-examine the requirements laid out in the agreement in three years in case changes in the fields require changes to course content. With a system in place, they expect any revisions to go smoothly.